The inimitable Dusky announce the return of their DUSKY PRESENTS event series with four dates across Bristol, Sheffield, London and Manchester. 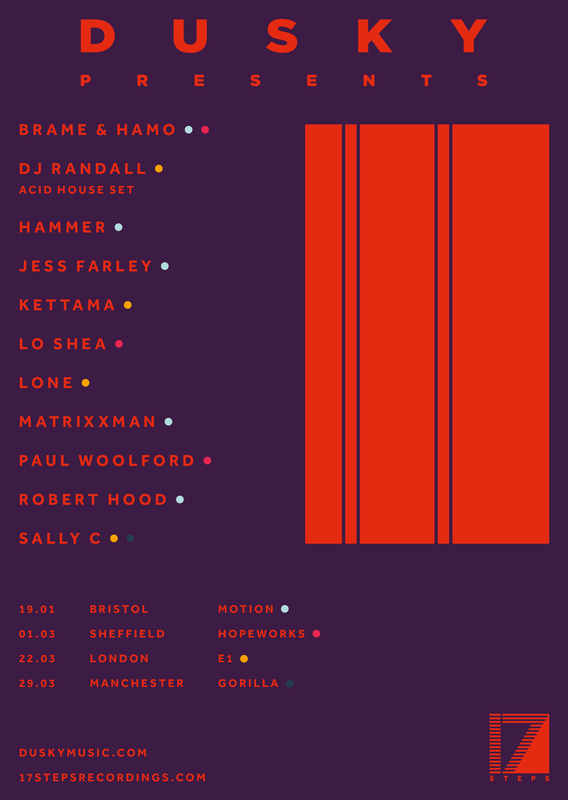 The duo will be joined by an eclectic selection of guests such as techno legend Robert Hood, R&S’s Lone, Dekmantel favourite Matrixxman, the resurgent Paul Woolford, and rising stars Sally C, Brame & Hamo, and KETTAMA. Fresh from a smash US tour and the release of their much-loved ‘Aset Forever’ EP (supported by Rampa, Red Axes, Adam Beyer among others), Dusky are getting back to their roots and their prominence within the UK underground scene by focussing on their event series, DUSKY PRESENTS. Each event and lineup is meticulously curated to ensure a night of authenticity which embodies everything they’re about as artists, producers and label A&Rs. They’ve mingled their heroes and long-time friends with 17 Steps debutants, including Brame & Hamo and Kettama who join the label with their Aset Forever remix package. The EP: Heralding the tour, the ‘Aset Forever EP – The Remixes’ with Brame & Hamo and Kettama drops 14th December. Irish born, Berlin-based duo Brame & Hamo rework ‘Amongst The Gods’, combining distorted kicks and industrial percussion with euphoric samples from the original, to create an unequivocally rave-ready flip. Fellow Irishman and rising star KETTAMA transforms ‘Staunch’ from a darkly brooding cut into a thumping hard house epic spiked with zapping synths and hefty percussion. The Tour: Dusky’s well crafted and diverse DJ sets, along with their live show and 17 Steps imprint, have earned them a place at the forefront of electronic music, but nothing matches their particular mix of talents more perfectly than a Dusky DJ set on home turf – this time supported by some of the most respected and cutting-edge names in electronic music.